The memory bench was created as a way to honor loved ones that have passed before us. It is a perfect addition to cemeteries, public parks, campuses, and backyards. Each bench is available with fully custom design options including: inscriptions, images, powder coating colors, and more. Give us a call today at (801) 414-1724 to order a memory bench. Our design team works with you step-by-step to create the memorial bench you have envisioned. 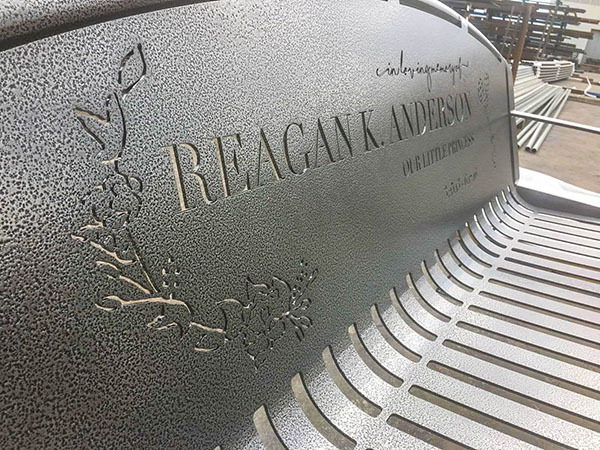 Below is an example of the detail that when into creating this custom bench to commemorate Reagan K. Anderson. To get started with the bench, first send us the design ideas you have. This can include photos, descriptions of what you’re looking for, etc. 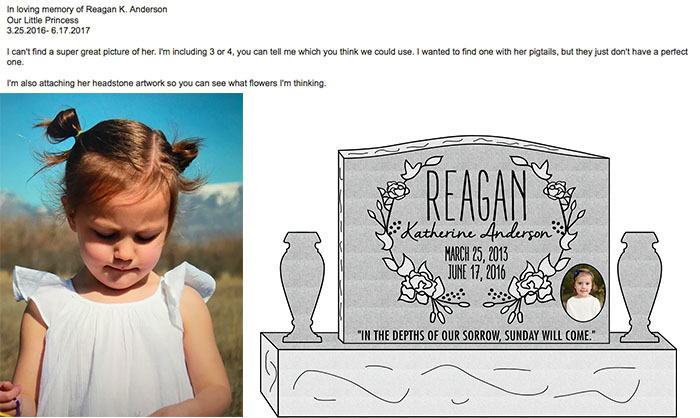 For this bench, we were also sent the mockup of the tombstone so that they would match. After we have received your ideas, our team gets right to work on the memorial bench design. The proof is emailed to you for approval before it is sent to be laser cut. This will be your chance to have any changes made to the memory bench. The memorial bench is laser cut from a single sheet of metal.The metal is then bent into shape and arms and legs are welded on. Powder coat is then applied to the memory bench for a long-lasting finish. It is then packaged up and sent to you. Losing a loved one is hard. 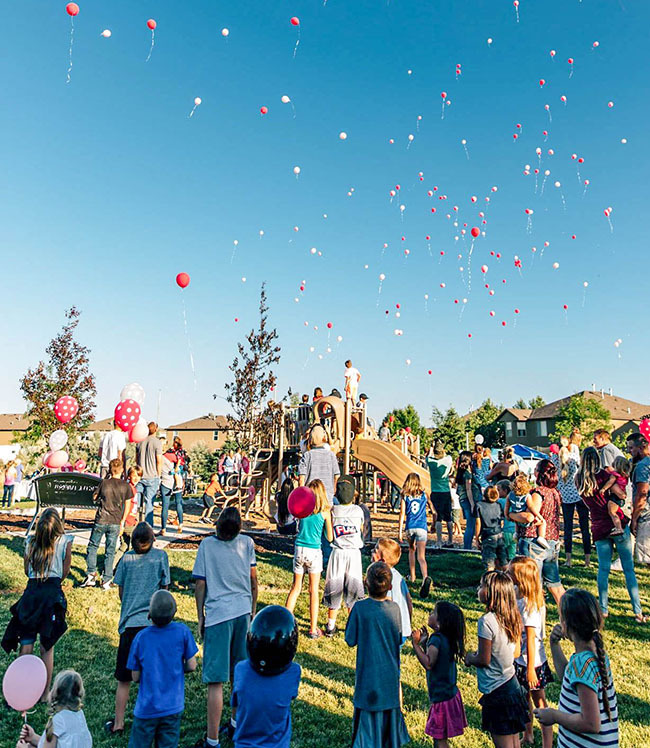 We wanted to create a custom bench where friends and family could go to share stories, laugh, cry, mourn and mostly, remember. It’s a way of keeping their memory alive while slowly putting back together the pieces of your heart. The memory benches are very special to our team at Smith Steelworks and each one touches our lives. Personalization is a big part of what makes our memorial benches so special. 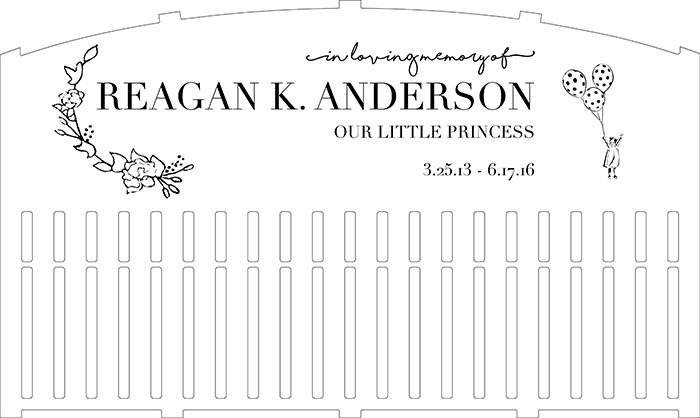 For Reagan’s Bench, we added a floral arrangement, polka dot balloons, and a calligraphy font. Black, Bronze, and Green are a few of our favorite powder coating colors. You can view our entire selection here. The colors stay vibrant, even after years of outdoor exposure. 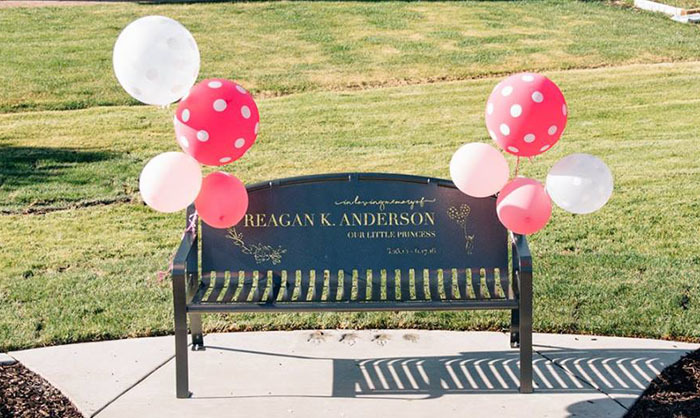 For this memory bench, Reagan’s family chose the Classic Arch Bench style. This style provides additional room on the back of the bench for designs and inscriptions.